Umer Khan is the Vice President of Information Technology and Information Security at SpaceX, a company that designs, manufactures, and launches the world's most advanced rockets and spacecraft. His role is to deliver technology and provide security to enable a business comprised of rocket scientists and engineers, full-scale USA-based manufacturing, and mission-critical launch, control, and recovery. Umer is also a partner of Mentors Fund, a seed stage venture fund investing in tech startups transforming traditional verticals. He was previously a Senior Director at Broadcom Corporation, with responsibility for the worldwide IT infrastructure and engineering tools and applications. Umer is a Founding Charter Member of OPEN SoCal. 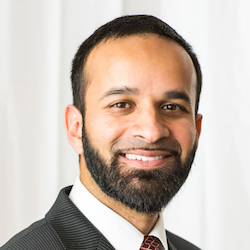 Umer has served as an author, editor, and reviewer for several technical publications related to networking, security, and UNIX, and his Cisco Security Specialist’s Guide to PIX Firewalls book became a best-seller in the industry. He holds 20+ professional certifications, and has filed for three US patents. Umer received his Bachelor's degree in Computer Engineering from Illinois Tech. He completed his MBA from the Wharton School of the University of Pennsylvania with highest honors as a Palmer Scholar (top 5% of the class). Umer is passionate about family and loves spending time with his wife and four children. He is also an avid student of the Arabic language and the Islamic Sciences.